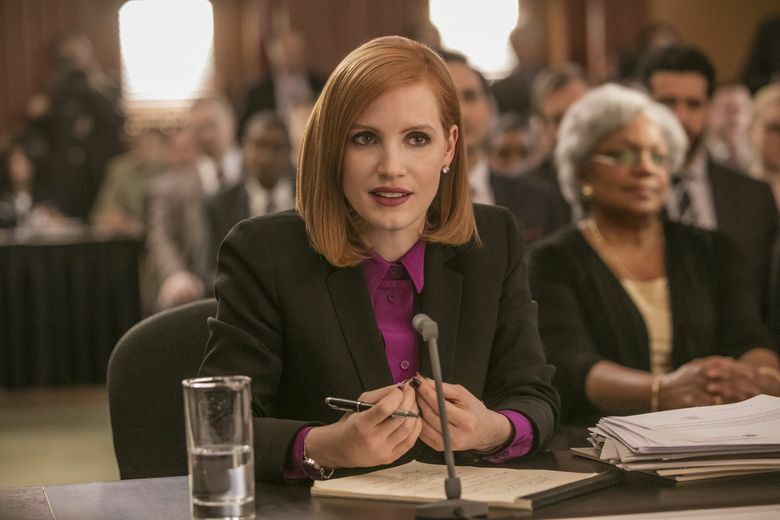 Jessica Chastain turns in a fascinating performance as a D.C. lobbyist who wants to get a bipartisan gun-safety bill passed. Rating: 2-and-half stars out of 4. “Miss Sloane,” slickly directed by John Madden from a script by Jonathan Perera, begins with a Senate hearing in which Elizabeth’s ethics are questioned. (That granite wall doesn’t entirely hold.) It then flashes back to show us the events leading up to the hearing, in which Elizabeth abruptly leaves her sleek, old-school lobbying firm to join a scrappy new one where everyone talks as rapidly as she does. Her goal: to get a bipartisan gun-safety bill passed. Her tools for the job: whatever it takes, including an idealistic new colleague (the always fine Gugu Mbatha-Raw) with a past that Elizabeth sees as potentially useful. 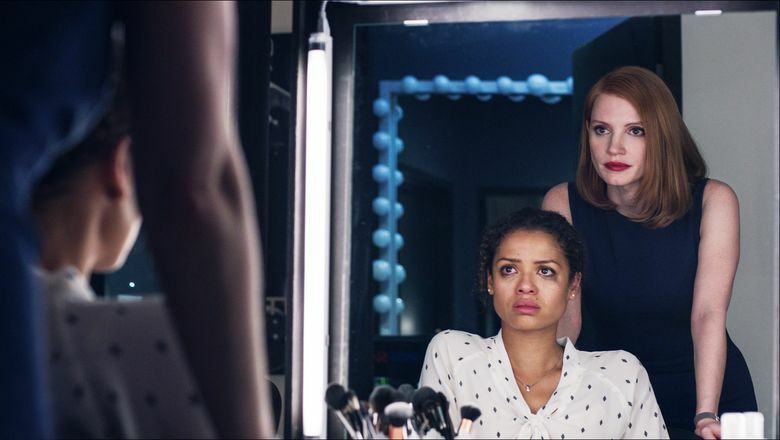 Paced and shot more like a thriller than a character study, “Miss Sloane” often feels overwrought (Max Richter’s melodramatic score doesn’t help) and longer than it needs to be, and the rapid-fire conversations at the firm — it’s like screwball comedy, without the wit — feel more like actors waiting for their cue than genuine dialogue. But there are small gems of character study throughout (particularly a lightning-quick scene with the great Christine Baranski, cigarette clenched in teeth like she might eat it if it displeased her), and one large one at its center. ‘Miss Sloane,’ with Jessica Chastain, Gugu Mbatha-Raw, Mark Strong, Alison Pill, Michael Stuhlbarg, Jake Lacy, Sam Waterston, John Lithgow. Directed by John Madden, from a screenplay by Jonathan Perera. 132 minutes. Rated R for language and some sexuality. Several theaters. Chastain, whose brittle Elizabeth never seems to exhale, let alone relax, reveals almost nothing of her character’s heart — and yet keeps us fascinated by her. (It’s interesting to consider how different this movie might be if it were called “Mr. Sloane”; we’d surely give a lot less thought to the character’s lack of warmth.) “I grew up lying,” says Elizabeth at one point, leaving us to fill in a story around her words. An intriguing character, who perhaps needs a more intriguing movie.